It's time to book your Myrtle Beach vacation rental! Welcome to Myrtle Beach Pet Friendly Vacation Rentals! See our available beach houses by entering your dates and # of guests below. Make sure to choose a Saturday to Saturday check-in/check-out date during the season. Are you looking for a Myrtle Beach vacation rental? We specialize in pet friendly vacation rentals in the North Myrtle Beach, SC area. We have your perfect pet friendly beach house vacation get-away! All of our beach home rentals are pet friendly. We have a nice selection of beach houses ranging from 3 bedroom units to 8 bedroom houses. Choose from canal homes with a dock, ocean view beach houses, swimming pool homes and oceanfront beach houses. We have a few duplexes where you can book one or both units. These are perfect for large groups and family reunions. All of our pet friendly beach houses are within 100 yards from the beach access and some are oceanfront and sitting right on the sand. Inquire today and book your family beach vacation with Myrtle Beach Pet Friendly Rentals & don't forget to bring the family dog! Afternoon Delight- Cherry Grove Beach section of North Myrtle Beach, SC. Overlooking the Cherry Grove Fishing Pier. Pet friendly oceanfront vacation rental. This two story, pet-friendly beach house is located right across the street from the beach. It features 4 bedrooms, 2 bathrooms and sleeps 12 people in beds. It has a large covered porch on the front of the house and a screened in back porch that overlooks the swimming pool. There is plenty of parking, a private swimming pool, and it is walking distance to restaurants, bars, shopping, golf courses and the beach! This beautiful beach house offers a couple options. It is pet friendly and has an ocean view. There are two separate units (upper & lower). You can rent one or both. Both units have 3 bedrooms and 2 bathrooms. They will each sleep 10 people in beds. There is a private swimming pool in the back yard. Beach access in right in front of the house. Perfect for large groups who want their privacy too. Great location! It is walking distance to restaurants, convenient stores, bars, and much more! This pet friendly beach house is like Harbor Haze which is right next door. It's also a duplex with two separate units (upper & lower). Both units are 3 bedroom, 2 bathroom that will each sleep 10 people. It is ocean view and has a private swimming pool. Plenty of parking and space to spread out. Great location that is walking distance to restaurants, convenient stores and bars. This single family beach house has 4 bedrooms and will sleep 12 people in beds. It is located just steps to beach with peeks of the ocean, from the porches. It sits on a canal with a beautiful water view. The canals are perfect fishing and crabbing and they lead right to the ocean. This beach house offers a private boat dock for you fishermen and watersport lovers. It also has a private swimming pool and fenced in back yard for your dogs. There is lots of space in this freshly renovated vacation rental. Oceanfront pet friendly beach house with two separate units. Both are 3 bedrooms, 2 bathrooms and will sleep 10 people in beds. You can rent one or both. Perfect for large groups. Wide open ocean views from both units. 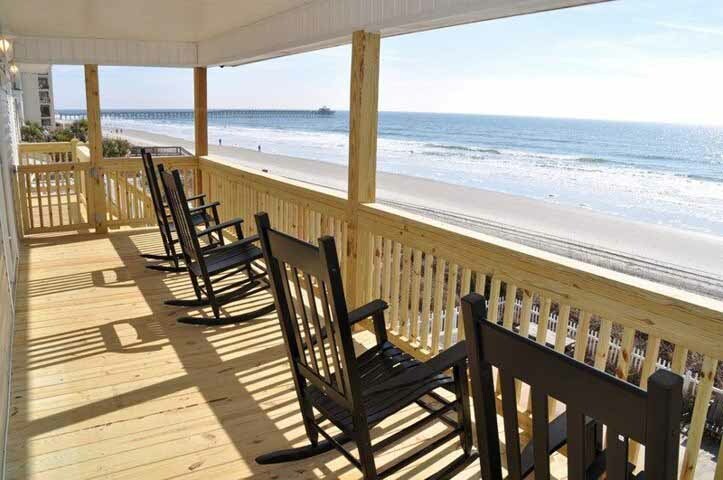 This beach house looks right down on the beach and the Cherry Grove fishing pier. It is walking distance to restaurants, bars, the pier, grocery store, and so much more. It is the perfect location! It has direct beach access out your back door with a fenced in back yard. This has been vacation rental favorite for many years! Large, pet friendly beach house. There are three levels in this house. The top level is a 4 bedroom, 3 bathroom unit that sleeps 12 people. We call it Bikini Top. The middle level is just like the top unit. We call it Bikini Bottom and there is also a ground floor 2 bedroom unit that we call Bikini on the Ground. We don't advertise the 2 br unit, but it can be rented along with one or both of the 4 br units, if extra space is needed. The back porches overlook the swimming pool and offer water views of the canals. This beach house is only 100 yards to the beach access and pets are welcome. This ocean view, single family beach house has 3 bedrooms and 2 bathrooms. It will sleep 10 in beds. Has plenty of parking, also has a fenced in back yard and a private swimming pool. Enjoy the ocean views from the covered front porch or hang poolside on your back deck or patio. Freshly renovated and ready for the upcoming season. Pet friendly and just steps to the beach!